One of the many reasons I’m not longer wedded to American Airlines is that the airline recently changed its upgrade policy to one which really doesn’t suit me. The current upgrade policy is now one which puts me at a serious disadvantage when trying to use one of the 4 systemwide upgrades top-tier elites are given every year. It’s also the reason I found myself sitting in American Airlines Economy class on one of the longer routes the airline flies. Since May 2017 American Airlines no longer prioritizes upgrades based on when a ticket was purchased and, instead, bases upgrade priority on the number of Elite Qualifying Dollars (EQD) a flyer has spent in the preceding 12 months. This is bad news for travelers like me who are happy to book early but do everything possible to keep their spending (and therefore EQD) as low as possible. Still, despite knowing that my upgrade chances weren’t all that great I went ahead and booked a roundtrip American Airlines Economy Class fare between Europe and Hawaii because (a) it was a very good fare and (b) my chances of an upgrade weren’t great but they weren’t terrible either (follow this link for details of what I booked and how much it cost). Well, the gamble didn’t pay off and my upgrade didn’t clear on my outbound transatlantic flight so I was consigned to seat in Economy Class. Between rows 13 and 17 American Airlines offers its Main Cabin Extra section where the legroom is considerably better than regular Economy Class (36″ v 31″) and where there are just 9 seats in a row giving the seats more width that regular Economy Class (18″ v 17″). Rows 18 – 22 still offer wider seats than the regular Economy Class cabin (18″ v 17″) but the legroom is no better at just 31″. Rows 26 – 40 make up the rest of the Economy Class cabin and is where some of the more cramped seats on any full-service carrier are to be found. With the exception of the exit rows the seats in this section have just 31″ of legroom and, as there are 10 seats in each row, just 17″ of seat width – for most passengers this is the section of the Economy Class cabin to avoid on this aircraft. Hopefully you can see the difference (you may have to look closely but it is there!). I’m not the widest of people but I do have quite long legs so legroom matters a lot more to me than seat width when it comes to choosing were to sit – that’s why I booked seat 26J. 26J is an aisle seat in the exit row on the right side of the aircraft and it has its advantages and disadvantages. A major advantage is that the exit row gives you more legroom than you could possibly use so stretching out during the flight is simple…. ….a major disadvantage is that, because it’s an exit row, the tray tables and personal screens are stowed in the armrests making the seats even narrower than the already very narrow seats in the rest of the cabin. I was prepared for the legroom v seat width trade-off so I was ok with what I booked….others may not be so happy. I wanted a seat where I wouldn’t have other passengers climbing over me if they wanted to get to the aisle while, at the same time, having a seat where I wouldn’t have to climb over anyone either. Seat 26J works well if those are your criteria. If you can’t book the exit row seats the centre seats in the front row of this cabin may be an option for you. These seats have more legroom than most seats in the Economy Class cabin and, because they’re not classified as being part of the exit row (they’re exit row adjacent) passengers with children are allowed to book them. Note: These seats are still very narrow as they too have their tray tables and personal screens stowed in the armrests. Most of the seats in the Economy Class cabin have a personal IFE screen built into the seat ahead…. In the exit row seats the power outlets are under the seat…. ….the IFE screens lift up out of the armrest…. ….the USB port is built into the IFE screen…. The fat is that, what you gain in legroom by selecting an exit row seat, you lose in space around you and space to put things. In non exit row seats things like the IFE controller and power outlets are easy to reach while in the exit row you have to fumble around underneath the seat to find the power outlet and you have to lean your body to one side to be able to get at the IFE controller. In the non exit row seats you have a seat-back pocket in which to store things while in the exit row there is one magazine holder (which is usually already full) between the three seats…. …and you have to make sure the floor is clear of all bags for take off and landing – storage space is essentially non-existent. There are other disadvantages to the exit row seats too. …and, because there are two lavatories directly ahead of the exit row,…..
…you’ll often find that people congregate in the space between the exit row seats and the lavatory taking up the legroom that makes the exit row special in the first place. If you’re particularly unlucky (as I have been in the past) you’ll not only have people congregating in this space as they wait to use the facilities – you’ll have the occasional group try to use the space as a meeting point for a mid-flight catch-up. Having people standing directly ahead of you and chatting (at normal volume) can be immensely irritating if you’re trying to rest, work or simply relax. I was fortunate on this occasion because the middle seat remained unoccupied for the duration of the flight but, from experience, I know that if all three seats are occupied it can get very, very snug and it’s hard to move without disturbing the person next to you. You have to really want the extra legroom if you’re going to book one of these exit row seats. There’s also an issue with the bulkhead seats (the centre seats in line with the exit row) that I should mention. A lot of passengers appear to think that this is a legitimate walkway to use to get from one side of the aircraft to the other. They also don’t seem to care that they’re disturbing the passengers in this row each and every time they’re forced to move their legs when someone wants to get by. I watched as one family allowed their out-of-control child run (or try to run) from one aisle to the other (via the bulkhead row) 10-15 times in the space of 10 minutes. Be aware that not all passengers are courteous if you choose to sit in this row. There were two flight attendants working the aisle on my side of the aircraft. Both were clearly overworked, one of them was perfectly pleasant and the one was obnoxious. I got off to a poor start with one of the flight attendants who didn’t like me photographing the cabin. I was the first person in the Economy Class cabin so I was making the most of not having other passengers around and taking quite a few pictures – this aroused suspicion. The Flight attendant could have approached me with a smile and asked politely if there was a reason for what I was doing (most take this approach) but she chose not to. She chose the “aggressive snarling face” approach. I ignored her mood, explained (politely) what I was doing and showed her Traveling For Miles on my phone. She then told me that I had to delete a picture of the door of the aircraft I had just taken because it constituted a security risk. The picture I had taken looked a bit like this…. 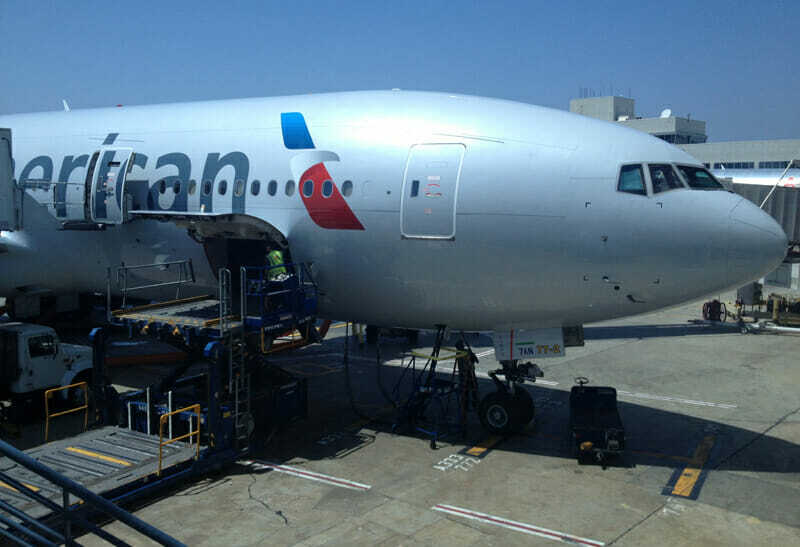 …just two of many pictures I’ve taken without issue on other American Airlines 777 aircraft. I deleted the picture as soon as the Flight Attendant asked me to but, when I can pull up schematics for large parts of a 777 with a simple Google search and when American Airlines Captains are happy for me to photograph the inside of their 777 flight deck,…. …I’m left wondering what exactly this Flight Attendant thought she was achieving in this instance. More importantly she was simply downright rude. It turns out it wasn’t just me. While this flight attendant’s colleague carried out his duties with as much courtesy as the poor guy could muster (he always returned a smile) the obnoxious attendant was short and sharp with all the passengers around me and never cracked a smile once while I was watching. This particular flight attendant have been having a bad day or, if past experience is anything to go by, she may also just have been one of American’s perpetually disgruntled flight attendants too – either way she wasn’t exactly a joy to be around. The best way to sum up the service is probably to say that one flight attendant managed to be polite and friendly throughout while the other managed the exact opposite – it didn’t leave a good impression. A few minutes after take-off the cabin crew brought around bags of mini-pretzels…. ..and around 35 minutes after take off drinks were offered. Cocktails, wine, beer, sodas and coffee were all available. Lunch was served an hour and 10 minutes after take off (we had taken off at 12:35pm) and the choice was one we’ve all heard before – chicken or pasta. The sauce that came with the chicken was a sweet BBQ sauce and, overall, the main meal was ok. Definitely not gourmet but also definitely edible. Drinks were also served with lunch with the same choice as earlier as far as I could tell. I didn’t bother with the salad as it looked thoroughly unappetising but the apple crumble cake was quite nice….what little there was of it. A big positive was that there wasn’t a long wait to have the remnants of lunch removed. The meal took no more than 15 minutes to consume and we didn’t have to wait more than 5 minutes to have the trays taken away – that was very good. Around 4 hours after lunch had been cleared away the crew brought around ice cream. There wasn’t a choice in flavors so if you didn’t want or like chocolate you were you of luck. Water was also offered with the ice cream but that was it. The lattice pastry was 90% pastry and what filling there was was pretty tasteless. The sponge was perfectly ok…..but then it’s hard to ruin a sponge when all you have to do is heat it up. This is certainly not a snack for anyone looking to cut out carbs or salt! All in all the food was mostly edible but hardly something you’d recommend to anyone you actually like – I’ve had better on quite a few Economy Class flights with other airlines. The Wi-Fi was generally pretty slow and dropped out more times than should be acceptable. On the amenity front there was a pretty pathetic pillow and super-thin blanket on seat when I boarded and, while the blanket just about helped out when it got cold part-way through the flight, the pillow was more of a nuisance than a help. The IFE selection was good. I’m not going to reproduce what I had on offer here as it will be meaningless by the time most people read this but, if you want to see what the airline offers, you can check out this web page. I’ve listed the negatives to sitting in the exit row (and in other parts of the Economy Class cabin) in the paragraphs above so, if you’re thinking of choosing a seat similar to mine, you should make sure you understand what you’re signing up for. I have to give kudos to the second flight attendant working my aisle as not only did he have to put up with his unpleasant colleague (although perhaps it was only the passengers she resented) but he also had to make up for her attitude to the customers – he worked really hard and his smiles were appreciated. We departed on time and arrived a little early. The flight was ok because I worked for almost the entire time but there was nothing about the American Airlines Economy Class hard or soft products that would encourage me to recommend them to anyone above the other airlines I’ve tried.